Half the fun of giving a party is selecting a theme and making the decorations. Your computer can be a tremendous help in making decorations, while also speeding things along. The computer is especially useful in making place settings for each guest. Place mats, napkin rings, and name cards can all be designed on your computer using clip art or designs of your own. 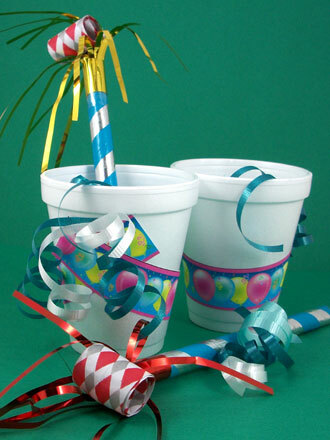 You can easily and quickly make party favors by decorating paper or foam cups with ribbon and images printed from your computer. This project requires few materials and is great for family, classroom or group craft time. 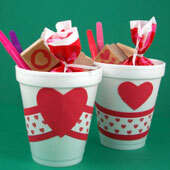 Come up with an idea for the favor that goes with the theme of your party. 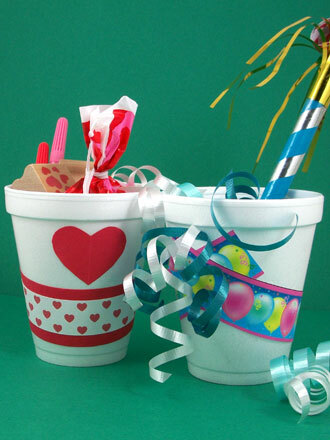 For New Year's Eve or a birthday party, you might make festive favors decorated with images of balloons and confetti. For Valentines' Day, using images of hearts is a natural idea. For a zoo, farm or circus theme, the favor might be animal-themed. Put your imagination to use here. Also, select a color theme for the favors based on your idea. Cut a 9" to 11" length of ribbon to wrap around the cup. Select a ribbon that matches your color theme. It can be anywhere from ½" to 1½" wide, and can even be cut from a sheet of pretty paper. Tip: Creating your own paper ribbon allows for the most creativity. You can layer a strip of decorative paper on a strip of plain paper. Or you could design the ribbon using a graphics program and print it. 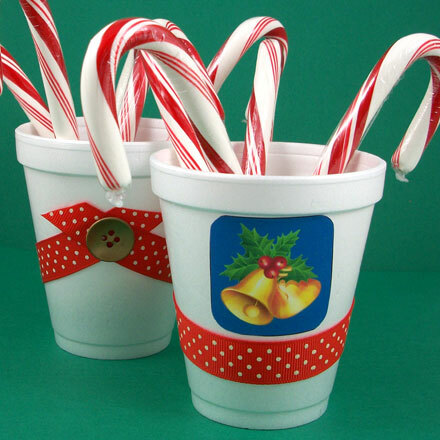 You also need images to glue on your cups. You can draw images in your favorite graphics program or use clipart. Most cups are about 3" to 4" tall, so decorations that are about 1½" to 2" in size work well. Be sure to make the design in a simple shape for easy cutting. When your design is complete, print it, making enough copies for the number of favors. Cut out the printed images. Tip: If you'd rather not use a computer, you can cut shapes from colored paper. You could also find wrapping paper that matches your idea and cut out designs from it. Wrap the ribbon around the cup. Start with the center of the ribbon near the base of the cup, and wrap upward and around until the two ends overlap on the back. Glue the ribbon in place. Glue the image on the cup in the white space above the ribbon. You might also glue an image on the back of the cup. If you like, add more embellishments to the favors—buttons, glitter, ribbons, and sequins are nice additions. 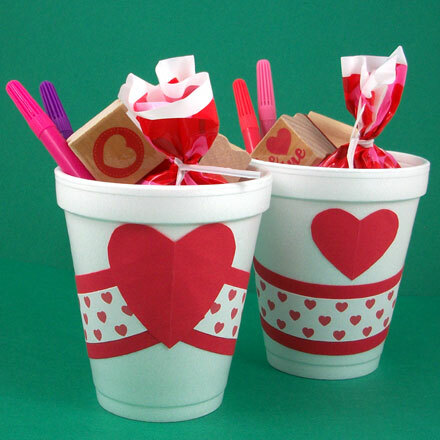 Once you are finished, fill the cups with candy, nuts and marshmallows—or fill them with little toys and balloons, or maybe crayons for coloring place mats! Tip: If you have trouble with the cup tipping over, place something heavy in the bottom, like jelly beans. That's it! Time for the party! 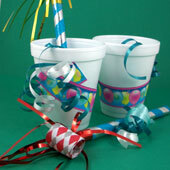 Tip: For New Year's Eve or a birthday party, glue ribbon curls to the cup for a more festive look. 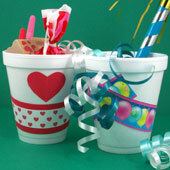 You can also fill the cup with homemade confetti made of small curls and ribbon snips or paper punches. Tip: Make a paper ribbon from Aunt Annie's Little Red Hearts ePaper and layer it on a red paper strip. Fill the favor with craft goodies. Tip: Glue a button where the ribbons overlap. This favor is decorated with 5/8" polka dot grosgrain ribbon and a free bell image downloaded from a website.